that's probably why a discouraging word was seldom heard, and the skies weren't cloudy all day, either. 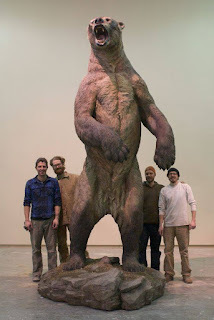 And remember that this is a pic of the "average" sized short faced bear remnants found. Among any species of animals there is a significant portion of the population that is DOUBLE the average size. The average male grizzly weighs 600-800 lbs and 38 inches at the shoulder, some are over 1500 lbs and 60 inches. That would make for a BIG short face bear.